On the first week of classes of 2018, the second graders at Global Academy silently form a line to head out for a bus safety drill. The sun comes up onto the asphalt parking lot, which the K-8 charter school – one of the highest-performing academic schools in the state – shares with Pizza Man, NAPA Auto Parts, and other tenants of the strip mall just off Central Avenue in Columbia Heights. 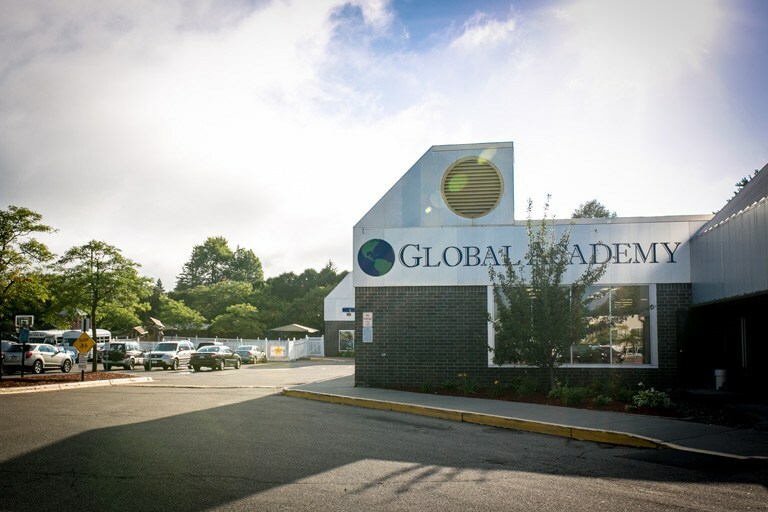 This year is the eleventh year Global Academy has been in operation, and it will also be its last year in the strip mall. “It really is an equity issue,” says Helen Fisk, co-founder and director of Global Academy. “It’s just not fair that kids who live half an hour away over in Woodbury have the most beautiful facilities and space, and our students are crammed into a strip mall by a bus terminal with no green space.” Helen, who admits the mall location holds a place in her heart as the birthplace of the school, also has pictures of the new space taped on her door. Beginning in fall 2019, Global Academy will be in what was formerly the home of United Theological Seminary (which is moving to a new location), located on 10 acres in New Brighton. Global Academy is a K-8 International Baccalaureate charter school in Columbia Heights. As soon as you step inside Global Academy’s inviting reception area, it’s hard to imagine it as a former shopping center, even with Helen pointing out the kindergarten and first grade rooms where the school went through its “imperialist phase” and took over a tanning salon, tax office, and hearing aid company. “Our classrooms are lovely and well-equipped,” says Helen, who has been a wise financial leader of the charter school. 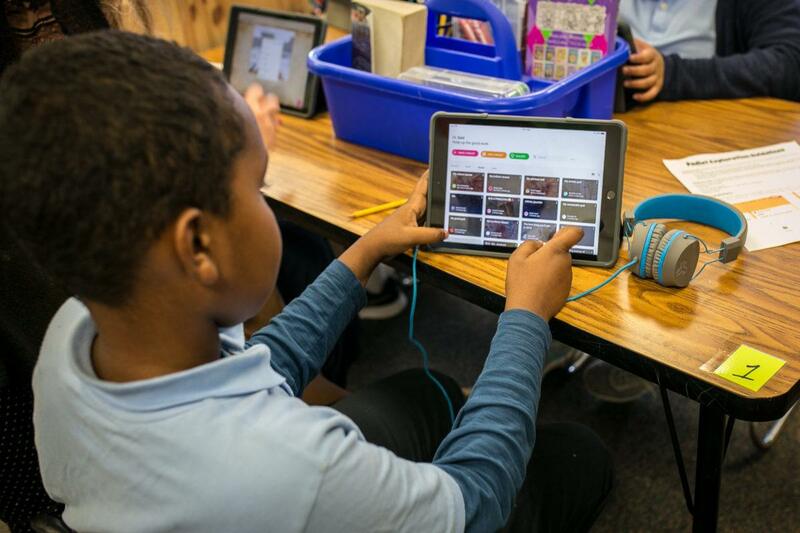 “The only thing teachers have asked for is more space.” Indeed, every classroom, though tight, has a SmartBoard, kids performing exercises on iPads, or passing around a microphone to enhance hearing. Global Academy has a diverse range of students: 82% are students of color, 36% are English Learners, and 85% qualify for free/reduced lunch. Helen argues that it’s because of – not despite – the fact of this diversity that Global students excel, paired with rigorous curriculum and calm culture. With several years of higher-than-average test scores in both reading and math, Global Academy was listed as a school that was “Beating the Odds” multiple years by the Star Tribune. Helen Fisk, Director and Co-Founder of Global Academy, demonstrating EnVOY, the non-verbal style of classroom management system used at the school. With proficiency levels historically at or above the state average, it’s not surprising that the school has a waiting list between 1,000-1,200 kids for the past couple years. 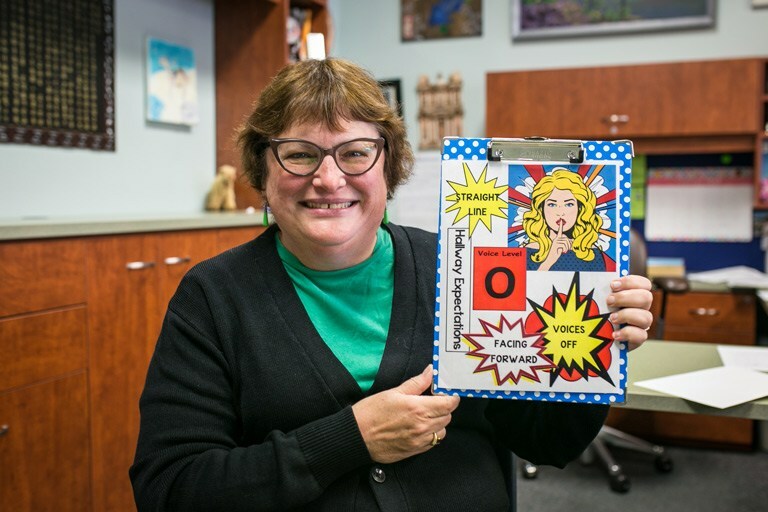 When asked about the secret sauce surrounding the school culture, Helen holds up a clipboard with comic-strip-styled hallway expectations – “straight line,” “facing forward,” “voices off,” and a woman signaling to be quiet. She also points out the awards and certifications the school as earned for being certified in a non-verbal classroom management approach called ENVoY®. 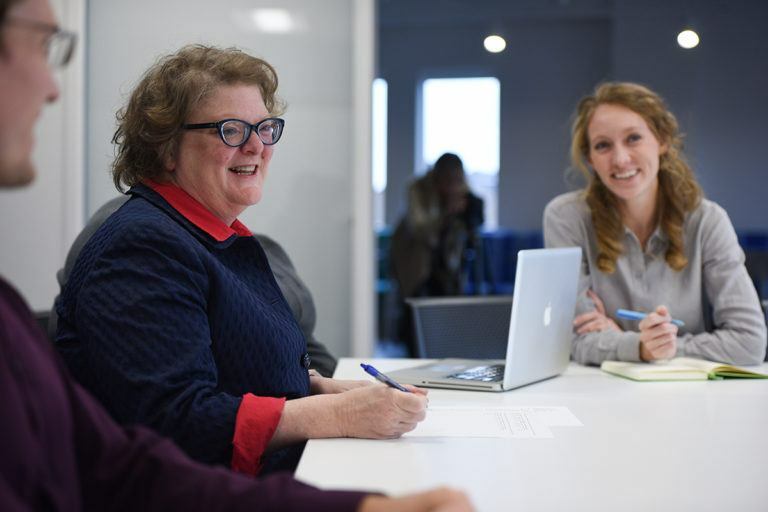 Helen attributes Global Academy’s long waiting list not just to academic excellence, but also to the school’s responsiveness to the needs of immigrant families. 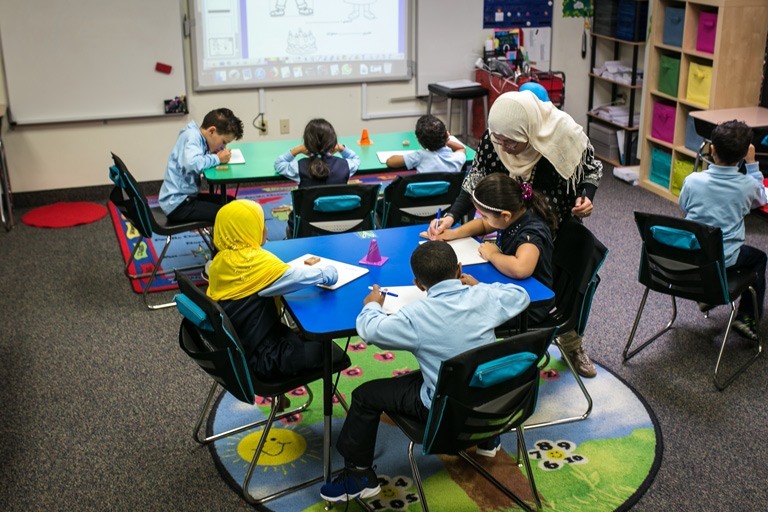 The students are mostly East African or Arabic immigrants and from Muslim families. This year, school was slated to start on August 21, but when the administration got calls from families that Eid, an important Muslim holiday, was going to start a little later than expected, the school decided to put the start day back a few days. Arabic is also one of the main languages the school teaches. “We’re successful with immigrant kids because we start from the assumption that they can learn and grow just like any other kid,” says Helen. A Global Academy teacher working with students. Global Academy has 420 students. Global Academy’s Affiliated Building Corporation (charter schools cannot own their own buildings) is leveraging a loan from Propel Nonprofits to purchase and make improvements to the former United Theological Seminary buildings. With the move, the school will have more space – both green space and classrooms – and will also add a pre-k, since many kids start school at Global Academy with no exposure to English. “There, we’ll have space to do production-level assessments like making videos and art, and for the older kids to have a space of their own,” says Helen. “We somehow ended up with the 420 best students in the Twin Cities,” says Helen. As we wrap up, she’s already getting ready for her next meeting of the day: a site visit to the new school where those students will be this time next year. Learn more about Global Academy on its website. Propel Nonprofits makes loans for working capital, lines of credit, and short-term and long-term facility projects to a wide range of nonprofits.